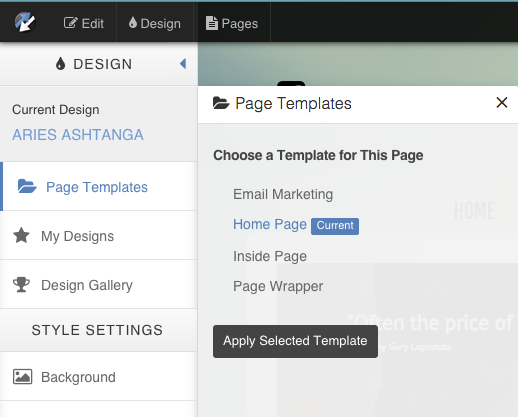 Page Templates is located within the Design tab and displays the different page templates available for your website. Email Marketing - refers to the template used with the Aurora Email Marketing service. Home Page - refers to the template used for the site Home page. This template should ONLY be used for your Home page. Inside Page - refers to the template used for any additional pages within the site. There can be multiple Inside Page templates. Page Wrapper - refers to a simple page wrapper that applies your logo, color scheme, and site menu to a page that is integrated with a service such as Mindbody or the Aurora Blog. This template should ONLY be used with service integrated pages. Complex Layout - More content areas are provided in each Region. Sidebar Left - Provides a Sidebar content area on the left side of the page. Sidebar Right - Provides a Sidebar content area on the right side of the page. Simplified Layout - Reduces the number of content areas for a more simplified layout. Standard Page - Basic template used. A seen on the Home Page. Standard - Header Image Behind - Images in the Header region/content areas will appear behind any color set within the "Design' tab section. Standard - Header Image In Front - Images in the Header region/content areas will appear in front any color set within the "Design' tab section. Within Page Templates, you will see the current template applied to the page you are on. To change the template for the current page, select the template that you would like and click 'Apply Selected Template'. Note* Existing content may be altered when changing templates. You do have the option to change the template for an existing page, but it is generally recommended to keep pages as they are and utilize Page Templates when creating new pages for your site.